One of the goals of Horace Mann School is to create in students an enthusiasm for and an interest in learning. At the Lower Division, that enthusiasm and interest is tangible not only in the classrooms, but also in the hallways, library, Arts and Technology Center, and on the playing fields. The Lower Division serves 460 children, ages five through eleven, in kindergarten through grade five. In order to serve those children, the school creates a dynamic and supportive environment where students can stretch themselves and take risks as they explore the world around them. The program incorporates the elements of a traditional and structured program with the innovation and enrichment that make learning come to life and places all of this within a context of community and social and emotional development. The Lower Division has two sections of kindergarten and four sections each of grades one through five. In the fourth and fifth grade, the program is departmentalized, and homeroom groups move from classroom to classroom for different subjects with different teachers. At every grade level, the classroom teachers work as a team to discuss curriculum and program. The grade teams also work closely with the teachers who specialize in different areas and work with the children across grade levels. The Horace Mann Lower Division provides a strong academic foundation of intellectual and creative pursuits with a focus on ongoing skill development. The language arts curriculum focuses on basic skills as well as appreciation of fine literature. Reading, writing, grammar, spelling, penmanship, critical thinking, speaking, and listening are all important pieces of the program. Social studies provided a stimulating introduction to history, geography, culture, and current events with a focus on skill development and conceptual learning. The mathematics program emphasizes mastery of basic skills, the development of curiosity, creativity, logical thinking, solving problems, and the ability to make connections between mathematics and other subject areas. Science gives children the opportunity to explore the everyday world. Children work with hands-on activities and experimentation as they learn about the scientific method. The Activity Center extends the science classroom work in a laboratory setting. The study of French and Spanish begins in the first grade when students are introduced to each language for one half of the year. In the second grade, children choose to pursue either French or Spanish for the rest of their time at the Lower Division. The foreign language program capitalizes on the children’s innate curiosity and affinity for new sounds to focus on content learning and native language ability. Culturally authentic materials, songs, and games link French and Spanish cultures to the spoken and written word. The Horace Mann Lower Division provides not only a strong base in the traditional subject, but also an unusually rich web of cross-subject study and interdisciplinary connection. The Library, Technology and Arts Programs are designed to provide a bridge among disciplines while serving as a focal point for a variety of learning activities. These cross-curricular programs provide opportunities for special projects, and the mechanisms to make learning more personal, more meaningful, and more long-lasting. The visual and performing arts are a vital part of life in the Lower Division. 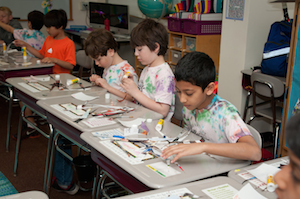 Art classes allow students to express themselves while learning about the language and structure of art. Through the Art Enrichment program, art teachers work with classroom teachers on curriculum-based projects. Children have music classes beginning in kindergarten. The program focuses on the study of music concepts, listening skills, and personal music growth through practical involvement. In third grade, the children can join the instrumental or choral music program, and more choices become available in following years. The dramatic arts program works hand-in-hand with the music program, giving students the opportunity to explore both structured and improvisational activities. The Publishing Center collaborates with classroom teachers on curriculum-based projects. Students are involved as much as possible with the actual construction of the books that are published, whether they learn to use the binding machine or to sew signatures. Classroom anthologies and individually published books are on display in the library. 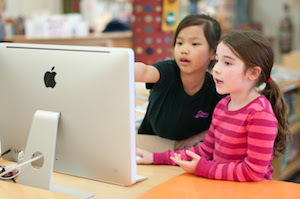 The library and the technology lab provide opportunities for project-based learning. Students visit the library for research and independent reading. They work on computers in the classroom and visit the computer rooms with classroom teachers. Faculty members receive special training and work with the technology coordinator on curriculum development projects that serve as a focal point for integrated learning. Horace Mann School has a commitment to developing both mind and body. The physical education department offers developmental activities designed to accommodate a wide range of student abilities and interests. The program takes advantage of campus resources, including the gymnasium, outdoor field and playgrounds, and the campus fields and pool. Activities like gymnastics and swimming, individual and team sports, as well as a physical fitness program encourage responsible decision-making, confidence-building, and teamwork. Children also make use of the physical education facilities during recess, and some children continue these activities and others in the optional After School Program. Everything at the Lower Division exists within a framework of community. Teachers are committed to maintaining a classroom environment in which every minute is important and in which every student counts, and the students learn to value themselves and each other. Expectations are clear, and adults and older children model the behaviors that others are expected to follow. Students are treated fairly, and discipline and consequences are consistently enforced. Students learn that these expectations matter. This framework provides the flexibility necessary for students to experiment and learn within limits and boundaries. Families are a very active part of the Lower Division community. Because the school is not a neighborhood school, the sense of community spirit must come from within. Communication between school and family is very important, and teachers are in frequent contact with parents to share a performance or project or to discuss an area that needs improvement or reinforcement. The student body in the Lower Division is comprised of children who are motivated, highly focused, independent, and genuinely friendly. This warmth and electricity helps to establish a culture where students and teachers really want to do their best, to take themselves seriously, but not too seriously, and to do something special.